Ashwagandha (Withania somnifera) is the most important tonic in the ayurvedic tradition of healing of India. From a quality control perspective, it is a challenging botanical to definitively characterize, because there are at least five chemotypes traded as Withania somnifera. With the AHP monograph, we were able to identify and characterize three of these. Future work with additional samples will help to characterize all chemotypes. 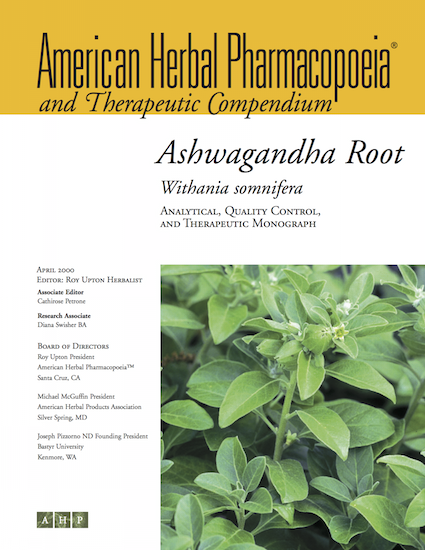 The ashwagandha monograph was one of AHP’s earliest monographs. Though in need of revision, it establishes the basics of identifying the species. Much of the research of the Therapeutic Compendium focuses on adaptogenic, anti-inflammatory, antioxidant, cardioactive, and immunomodulatory activity and its ability to reduce cortisol levels under stress. There are some concerns regarding potential interactions between ashwagandha and conventional medications, predominantly with sedatives.